Educational and fun. Kids use their creative ability to design an endless variety of boats using only 8 pieces which you cut from 3/4" stock. All pieces are assembled with pins - 1/4" dowels - and are held in place by the smokestacks - 7/8" dowels. Boats can be pushed or pulled without coming apart. Plan includes FULL SIZE drawings for all pieces, including the storage box. Box measures 19-1/2"L x 11"W x 1-1/2"D. An illustration sheet can be glued to the box lid showing how to assemble 18 different boats including a tug boat, a freighter, an oil tanker, a luxury liner, a ferry, and various naval ships. Order #1191 Toy Boat Blocks hardware parts package separately or see #1192 Special Offer. 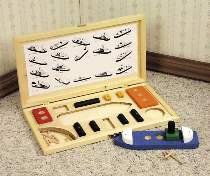 The #1191 Make-A-Boat Hardware Parts Package contains the hinges, box hasp and all wood dowels necessary to make one Make-A-Boat project pictured. The #1192 Special includes both the project plan and hardware parts package. Project plan, remaining wood and finish are not included in parts package.